This root canal was completed 2 months ago. The patient continued to report pain with no relief. The dentist had also recently worked on #2, placing an occlusal restoration. My examination found #2 & #3 both very sensitive to percussion, normal probings and lingering pain to cold on #2. Since both teeth were very sensitive, the diagnostics become very difficult. My original recommendation was to adjust the occlusion on #3 and re-evaluate in a week. However the patient returned to the office later in the day experiencing severe pain, pointing to the vestibular area above #2 & #3. My instincts pointed to #3. We performed diagnostic anesthesia on #3 by infiltrating a small amount (approx. 0.25ml) mesial to #3. Within several minutes the pain was gone. It was then determined that the pain was coming from #3 and endodontic retreatment was initiated. Upon access and removal of gutta percha, no additional canals were visible. Suspecting a fourth canal, I began removing dentin from the MB groove using slow speed handpiece with #2 round bur and ultrasonic instrumentation. A fourth canal was located. The original difficulty in finding this canal was caused by the fact that it was completed covered over by secondary dentin. The patient was informed of the fine work the general dentist had done in finding and filling 3 canals. There was no way that this fourth canal could be found without the use of the operating microscope. 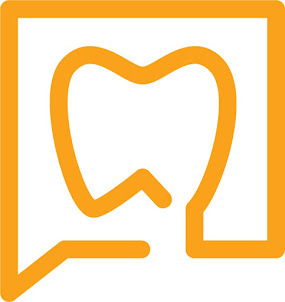 Since almost all maxillary first molars have a fourth canal, make sure an look closely in the MB groove for the forth canal. 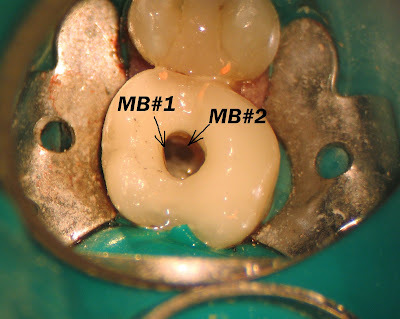 This process of searching the MB groove should be done with an operating microscope, to facilitate this process as well as prevent iatrogenic damage to the tooth. Very nice case - that microscope has really changed endodontics, hasn't it? Amazing. I don't know how anyone can stand doing endodontics without one!